Wau is a type of bird kites are popular in Malaysia. It is the type of kite that has the shape of birds, and are available in various types. Normally, bird kite will be attached to the sound of gong or a bow on top. It aims to generate buzz bungi produced when the wind through the bow span. When blown into the air, bow wow is a loud sound. Some kites are also buzzing played at night because it can produce a good sound. Many types of bird kites decorated with vines motif of traditional forms, or images of birds that became the name for the type of kite is a new type of shape. Wau leaves, also known as the west is a type of kite kites are popular. 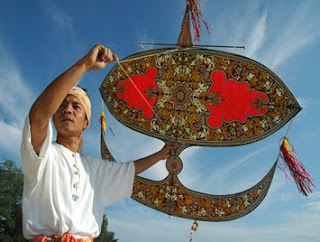 It is a traditional kite that has been played by hereditary in Malaysia. Wau Wau in the leaves resemble the shape but is wider and lighter. Wau leaves also have interesting patterns, but the pattern is drawn and not using tear ("cut and paste"), as the other wau-wau. It is also the only one who does not have a traditional Wau buzzing. Because the pattern is drawn on the body Wau, and not patched, it can fly high, even during the time the wind blew gently, as when in the morning. Therefore, it is also known as Wau morning. Besides drawing on the kite body often using batik, but it is often painted by artists and batik-makers not Wau. In addition, forms and shapes of leaves Wau is a dynamic and rapidly changing, often times it displays the original and unique design that starts adopted in competitions. Among the causes is the pattern painted by artists in other fields as well as it is drawn, it is easier to create new patterns from tear cut and paste techniques. 1. Wau spine was measured on three sections and then marked the third division. 2. Wau is tied to the wing first. 3. The wing is also bound to be tied at the spine. 4. Tie at the top and bottom pieces of the spine. Make sure the parts are well balanced in both sides. 5. Attach the end of the tail and then to link the end of the wing. 6. For the particular type of Wau months back, pieces of bamboo form a semi-circle ditaut on the wing and tail Wau. Bamboo pieces enemies diraut thinner shaped into a circle in the middle belt tied to Wau. Its size is determined by the ratio that is equivalent to the area of the head of Wau. 7. The final step is to head Wau is the binding part of the head of Wau in the wings with a distance of 2 inches from the spine. 1. Measure the paper size. 2. Then marked with pencil and paper have exceeded two centimeters from the frame. 3. Cut the excess paper and Wau had cut in the form of 'V'. 4. Glue the paper on a frame by using starch glue. 1. Fold the four-color paper for the wings, and fold to the tail. 2. Start painting from the chest up to the tip of one wing of the empty space to site area deer, the tail section, the pattern must be drawn with the pattern on the wing. 3.Corak be cut using a sharp knife is a typical pattern and the basic pattern of Wau. 4. Patterns will be posted on the paper color, usually gold color with glue on the back of the paper sweeping pattern. Glue should be mixed with water first to avoid wrinkles. Patterned paper is placed on a damp cloth. Colored paper is placed gently on the paper pattern and then flattened with a hot iron over a damp cloth before. 5. Cut the pattern to be torn and post again with a different colored paper to complete. 6. Paste the carvings on the ground tearing Wau had just swept the starch glue on the sides only. brush painting. For Wau decorations will be affixed on the back of Wau decorative paper to cover the defects of bamboo and bone Wau-wing cross. The paper does not absorb water. In addition, Wau is not posted back furnishings and sculptures torn paper has only three or four layers of Wau alone compared with ornaments that have up to eight colors. Jambul or signs attached to or wrapped around the tail wing of Wau. Guavas are usually made of paper 'crepe' cut with scissors is elongated to form a fringe. Trunk using the same ingredients but fitted with a crown on the head of Wau. The main function of the arc is to produce sound when flown Wau. Consists of four components, namely, 'bok', leaves ibus, carbuncle and bamboo chopsticks. 1. Cut pieces of bamboo with the size of half the length of the wing Wau. 2. Faces of the pieces, cut the dried leaves ibus follow the desired sound compatibility. 3. To create a carbuncle, Chinese bamboo can be used and the two-centimeter cut and punched in the middle of the size of the arc. 4. After the three components listed, stick a bow on the head with bamboo chopsticks Wau and then tied using nylon thread. There are five basic components of a traditional Wau Wau which consists of the head, bow, or drone, Wau-wing, "torek" or the waist and tail Wau. Among the raw materials needed to make Wau are bamboo, rattan skin, gum of trees and other appropriate requirements to produce a Wau. In addition, the expertise and skills are also key aspects to producing a quality Wau as expertise in the selection of raw materials, craft skills and knowledge in the field of aerodynamics. To ensure the Wau to be produced with quality raw materials like bamboo in particular should be selected more carefully. So there are some tips and taboos that are involved when to cut and save the bamboo. not in the bush or orchard. 2. Choose a bamboo that looks dry, preferably in the middle of the hill. 3. Do not cut the young shoots of bamboo because bamboo has a lot of starch and are easily attacked by pests. 4. Bamboo is tilted toward the sun rising is better because of strong beliefs by the elders. 5. Hot and dry weather conditions are ideal for cutting down the bamboo as the mid-afternoon. 6. If you cut the bamboo in the morning, make sure loggers dense shadows. 8. It is better to cut the bamboo have been destroyed on the spot. 9. Tip of the elders in Kelantan in bringing back the bamboo is harvested, will leave a message to The powder is, "Oh Sang powder, I lived right is your right, my right temple kelik this is mine, you follow the legal tok I am, you make Hok here. " Bamboo will be kept down for at least a year before the expression became the Wau. Usually a place of storage must be high to prevent the bamboo from the man passed. 1. Bamboo is stored in wetlands or submerged in the mud. 2. Bamboo is planted in the sand and lit bonfires on it for an hour. 3. smoked pieces of bamboo in the fire. Bamboo should be in shape to remove the parts that are not needed, such as joint and skin. In addition the aim is to provide a balance of shape and weight of the wings of Wau. Special knives used to whittle and to be really keen to ensure that the work can be performed with ease and avoid mistakes. 1. Part of the spine in the shape of up to 1.0 centimeters with the soft and medium hard. 2. Parts of the wing blade in two halves in the shape up to 1.5 centimeters and more refined at the end of the stick blade of the palm. 3. The tail section has two parts must also be in the shape of 0.5 cm. 4. Faces of reed blades to the waist and shaped in a circle. Sharpener at the top is thinner and smaller in size it is 0.5 inches for easy set up. West of WauVarious types and forms of "Wau" was created. Among the "Wau birds", Wau pari "," Wau frog "," Wau bayan "," Wau peacock "," Wau cat "," Wau jala budi "," Wau kebayan swing "," Wau Wiwik "," west of Wau "and is very popular with the Malays were" Wau months. " Normally the "Wau" will be played by two people, which will hold a "Wau" and another called an interpreter who holds the rope bridge. When the wind blows, the rope will be pulled against the wind currents and how to extend until the draw string "Wau" was high in the air. Ray of sunshine will add more beautiful "Wau" colorfully decorated. At present though "Wau" still have a place among the Malays, but the kite has not been noticed by the lack of local and international communities. Various shapes and patterns kite was invented, there are kite-shaped people, ships and any link that is played with two strings. Most of the show "Wau" and the kite is still a place in Malaysia, especially during the days of celebration or competition "Wau" international. Making a "Wau" rather complicated and time consuming, the work to be whittle bamboo frame, balancing the wings to stick the paper onto the kite took two weeks to get ready. Framework of bamboo spine kites larger than its wings, then tied with string in the form and nature. Framework that has been prepared to put up with three layers of paper thin and translucent with different colors. The first layer of glossy paper, the second layer uses a different color and patterned clouds old to the patterned bamboo shoots or cloves that have been drilled. In the third layer is a different pattern already be posted. Of the head or snout and the other side of the left and right wings, will be decorated with a fringe of fine-colored signs add more beautiful appearance. Busul be stretched at the back of the neck, wow, so that they produce a humming sound when flown in the air. Busul rembia made of leaves or pine that has been soaked and then left to dry dilurut. It is shaped like archery equipment. Rope tied to the helm of the wing and shoulder bones back to cushion the bottom of the wau wau-drive Three. According to the origin of the other, "Wau" Month of birth as a symbol of reunification Srivijaya Empire by Lord Young. After the death of the king of Srivijaya empire builders Sri Jayanaga, the empire covering the whole of Southeast Asia began to split the country was ruled separately from the parent Srivijaya Medang Bhumi. In the early twentieth century show a figure-8, the grandson of Sri Jayanaga king named Jaya Sinha. He has several titles, including Prince Sabjaya or Sanjaya, Inu god, Series Panji, Panji Seri Kelana Mahisa, Raden Raden Inu Kertapati or Asmarajaya and Hyang Kamajaya, but he is more famous in tradition as the stories of Young Gods. Young Gods have conducted several attacks for the reunification of the Srivijaya Empire. Before Gods Young entered the attack, he had been meditating and when he finished, he returned from the cave to take the place meditating or 'institutions' "Wau" in which a map of the invasion and conquest of Srivijaya empire back or Southeast Asia itu.Dewa Young recapture The great empire is about the year 713 until 779 AD. After a victory, "Wau" Month became a symbol of the Srivijaya Empire, known as the Universal Soil Java. Head and neck "Wau" in the form of eagle that symbolizes the true king of all birds of a saint. His name is Riah, in Arabic called 'The Prophet Mahlail Alaihissalam' between 313 and apostles in the Bible, he was called by the name 'Mahalelselt'. In the tradition of his stories called "Birds shell Senses'. So, the head of "Wau" This month represents the soul and spirit of the Srivijaya Empire, and gives the basic meaning of the basic culture and civilization in this empire. Told that the bow "Wau" features twelve languages, representing twelve range states or regions that are consolidated back to the Srivijaya Empire, the center of the country. Twelve states were the Philippines, Vietnam, the Isthmus, Cambodia, Laos and North-Central Thailand, Burma, Burma organized the West and East Bengal to the Andaman Islands, New Guinea and the island of Sulawesi. While various means of twelve twelve twelve tribes in the area / state earlier. The circle in the "Wau" Moon represents the states of the mainland called Nusarantang adjoining areas. Stars that lies between the full moon circle denoted as' national central 'or' central government ', called' The Gold-Nusa Kencana and a full moon to the bottom of the "Wau" is symbolized by the island states called Nusantara Areas that are chained by the seas. "Wau" This month has three leadership that represents the three parts of the empire of Srivijaya and three helm is bound by a rope, which symbolizes the Srivijaya Empire was ruled by a central administration. In other origins, the kites are derived from the National Kembayat times Siti Zubaidah and "Wau" was called "Wau Lenggang Kembayat." "Wau" This was the Srivijaya Empire Builder of Young Gods. Its form is not as "Wau" Months as specified in the origin of the above. "Wau Lenggang Kembayat" This form such as "Wau fish" that exists today. Many more are the origins of "Wau", but almost all of them resemble the original motion was recorded. According to one story, wow it was originally a game without a name. Games played by children are made of certain leaves that attach to the spinal cord sheath leaves with banana or pineapple leaf veins. Wau is played in a windy place. One time, the name of the game without breaking the string, and the child was crying "wa, wa, wa, wa ...", then, according to whom the story, was born the word "Wau". According to another origin, which is closer to myth, it begins when the "Dewi Dewa Dani" maternity "Young Gods". Seven midwives remove afterbirth Young Gods to the sea. But "Mother" the god who was meditating on heaven do not feel comfortable sitting in heaven, so he went down to the Flat Field kulum page, and saw Young Gods placenta floating in the River Nile. Placenta was restored to a god named "Awang" the crest Rain Gods placenta and membranes that Young made "the" Wau for the Young Gods. To prepare Wau, the "Mother" Dewa Dewa Muda takes to be a bright spot interest Wau, Young Gods hands for wings "Wau", adjustable legs Young Gods hands and bodies made kites and Young God as crested hair Wau. When the "Wau" was raised, the bow sounded twelve languages and twelve modes. From the sound of the bow is the inclusion of "Wau". According to this origin, the kites are not any bows or bow, do not read twelve languages and twelve modes are called "kites". According to another origin, "Wau" manifestation of the spirit of rice. On one day, a farmer and his wife who had no children found with a beautiful daughter, and reared by them. The husband every day to bring drinks and snacks to the children in her home, where he played in the rice, which ultimately result in feelings of jealousy in her heart. She is beaten by his wife then fled from the farmhouse overlooking the west wind. Following the incident, rice farmers had a husband and wife, no fruit and resist disease. According to astrologers, who chased girls had the spirit of rice. To apologize, the farmer must make a similar institutions "Wau" this month and was present after harvest.